SSKC is a non-profit making club and we have given members copies of books from the best Karate series at various stages of their Karate careers. 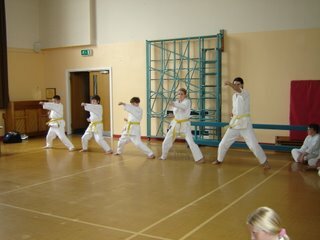 Thomas, Daniel, Sam and Adam attained their yellow belts in February, but we felt that Nakayama Shihans books would be a little too advanced for a youngster. Left: From Left to right is Daniel, Thomas and Adam from Selby, with Lucy and Michael from York Club punching Oi Zuki Jodan in Kiba Dachi stance under the watchful eye of Kato Shihan, unfortunately Sam was on holiday and "gutted" that he missed the opportunity of training with Sensei. In recognition of their continued efforts and hard work we decided to buy them all a Blitz Silver Tournment Gi. This should be good for at least 2 to 3 years training, depending on how they grow. Sam may have to wait a little while before even the smallest Gi fits him. By the time time June comes round and you are all ready for grading the gis should be well bedded in. Sam's Gi is still a little big despite being the smallest one they do. It want be long before you put a bit of a growing spurt on, just a good little karateka in a small package. Well done to you all. Osu!